Affinity describes the capacity of the ligand to bind to a receptor and is driven by electrostatic forces, hydrogen bonding, and van der Waals forces. Figure 2.1 Pharmacological models of ligand binding. (a) The affinity of a ligand (A) for a receptor (R) is determined both by its rate of association (kon) and dissociation (koff). (b) Left. The two-state model of receptor activation. Middle. The ternary complex model. Right. The allosteric ternary complex model. Within each of these models, the equilibrium dissociation constant of the ligand (A) for the inactive receptor (R) is represented by KA. Receptors within the two-state model of receptor activation (left), can transition between an inactive (R) and active state (R*), defined by the isomeriza-tion constant (L); ligand preference for the active receptor is governed by a. The equilibrium dissociation constant of the G protein (G) within the ternary complex model (middle) is represented by KG. The cooperativity between the binding sites when the ternary complex is formed is described by a. The allosteric ternary complex model (right) describes orthosteric (A) and allosteric (B) ligand binding, the equilibrium dissociation constants represented as KA and KB respectively. The cooperativity between the two binding sites when the receptor is simultaneously bound by both ligands is described by a . (c) Left. The cubic ternary complex model. Right. The allosteric two-state model. Within these models, the receptor can isomerize between an inactive (R) and an active (R*) state, defined by the isomerization constant (L). Within the cubic ternary complex (left), the equilibrium dissociation constant for the ligand (A) and G protein (G) at the inactive receptor (R) are represented by KA and KG, respectively. The thermodynamic coupling factor a describes the effect of ligand binding on receptor isomerization, P describes the effect of receptor activation on G protein coupling, y describes the effect of G protein-coupling on ligand binding, and S describes the effect of concomitant ligand and G protein-coupling on receptor isomerization. Within the allosteric two-state model (right), the equilibrium dissociation constant for the orthosteric ligand (A) and the allosteric ligand (B) at the inactive receptor (R) are represented by KA and KB, respectively. The thermodynamic coupling factor y describes the effect of orthosteric ligand binding on receptor isomerization, P describes the effect of receptor activation on allosteric ligand binding, a describes the effect of allosteric ligand binding on orthosteric ligand binding, and S describes the effect of concomitant orthosteric and allosteric ligand binding on receptor isomerization. Relative efficacy (e[RT]/p) of a ligand, together with its affinity KA, is defined by the application of this equation to experimental data. The stimulus-response coupling component (P) and receptor concentration ([RT]) within the relative efficacy term mean that the relative efficacy observed for a particular ligand is influenced by the coupling efficiency of the effector pathway of interest and the receptor concentration (Fig. 2.2a). A ligand with low positive efficacy may behave as an agonist in a well-coupled system and as an antagonist in a poorly coupled system. A similar relationship is also true in terms of the impact receptor concentration has on the relative efficacy of a ligand. Therefore, in contrast to intrinsic efficacy, which is a system independent property of the ligand, relative efficacy also depends on receptor density and the coupling efficiency of the response which is measured. Figure 2.2 Ligand directed GPCR signaling. Four examples are illustrated, based on a hypothetical GS-coupled GPCR with two cellular responses, cAMP accumulation and ERK activation. 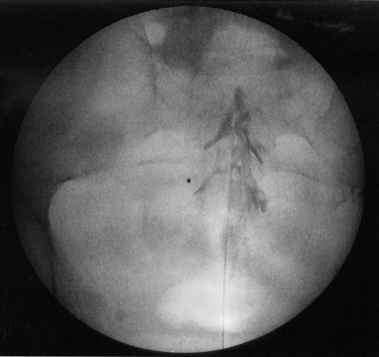 Ligand 1 reflects the behavior of a classical agonist in each case. Responses in (a) are sufficiently explained by the lower efficacy of ligand 2, which still elicits the same active receptor state as ligand 1. Ligand 2 is a weak partial agonist/ neutral antagonist in the cAMP assay, but more efficacious in the ERK assay, because of differences in stimulus coupling efficiency between the two end points (Section 2.1). 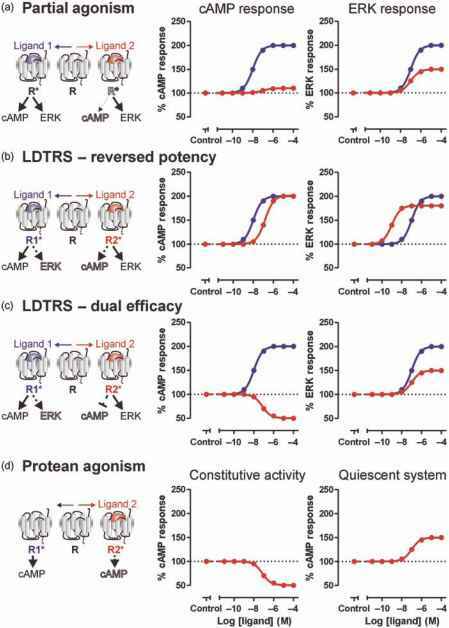 However, in a well-characterized system with a single receptor population, reversal of the rank orders of potency of ligands 1 and 2 in the two assays (b) requires ligand selection of different active receptor conformations, which directed signaling to either the cAMP or ERK pathway. Equally, the opposing efficacies of ligand 2 in (c) suggest an adoption of a distinct receptor state which couples selectively to the ERK pathway. If the two end points display differing levels of constitutive activity, these responses can also be accounted for by protean agonism (d), in which the receptor conformation stabilized by ligand 2 has lower coupling efficacy than the spontaneously active state. In this instance, ligand 2 will display inverse agonism in a constitutively active system, but agonism in a silent system, even when the same response is measured in both cases. model. Within this model, an agonist has the potential to stabilize a number of intermediate receptor conformations, each of which may be linked to a particular intracellular signaling pathway . Kinetic FRET studies using the a2-adrenoceptor have also suggested that rate and direction of the conforma-tional changes seen within a GPCR upon ligand binding can be used as an index of ligand efficacy. The rate of conformational change was found to be rapid for a full agonist, intermediate for a partial agonist, and slow and in the opposite direction for ligands with negative efficacy, known as inverse agonists [5, 7, 8]. An inverse agonist is defined as a ligand that can decrease the constitutive activity of a receptor, that is, the spontaneous activity of receptor in the absence of an agonist. In most endogenous systems, the level of constitutively active receptors is not sufficient to distinguish an inverse agonist from a neutral antagonist. As a consequence, the phenomenon of constitutive activity evaded detection experimentally prior to the advent of molecular biology and the development of recombinant cell lines. These techniques, in combination with the increased sensitivity of current functional assays, has meant that many ligands originally classified as antagonists have subsequently been shown to decrease constitutive activity and as such, are now referred to as inverse agonists (reviewed in Reference 9). Constitutively active GPCRs have been implicated in important aspects of human physiology and pathophysiology. For example, constitutively active melanocortin MC4 receptors and ghrelin receptors play key roles in determining the set point of hypothalamic neuronal pathways regulating body weight [10, 11]. Indeed, the activity of MC4 receptors is not only influenced by an endogenous neuropeptide agonist (a-melanocyte- stimulating hormone) but also by an endogenous neuropeptide inverse agonist (Agouti-related protein). The pathologies of retinitis pigmentosa and hyperthyroidism are also thought to be a consequence of naturally occurring mutations that cause increased constitutive activity of various GPCRs  . In addition, Karposi's sarcoma-associated herpes virus (KSHV) utilizes a constitutively active viral version of the human CXC chemokine receptor subtype 2 to promote cell proliferation and continued viral replication [12, 13] .